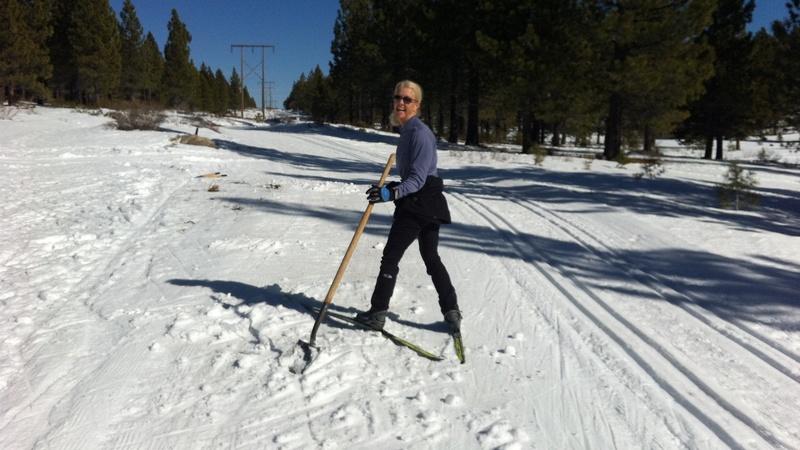 Last week marked my first, and potentially only, nordic ski race of the season. On Sunday, February 12, 2012, Tahoe Donner Cross Country (TDXC) hosted Paco’s Valentine 15k race atop a thin but fast base. It was my third time racing the course, which last year was moved and renamed from President’s Day. TDXC Manager JoJo filling in thin spots last month. The course this year was modified to accommodate a number of trail closures due to lack of snow coverage. The result was a slightly shorter and faster, less technical course, which generally works in my favor. I skied most of the course the day before the race, and was worried about the atrocious amount of dirt and rocks showing. The snow was in its worst condition since the season’s late start last month. This motivated me to reclaim an old pair of skate skis that I had loaned to a friend last season. It was a little weird to be waxing and race prepping a pair of “rock skis.” I was not the only one – it looked like retro ski day out there. Turnout for the race was low, but better than I expected, with 4 dozen men and fewer than 20 women. I recruited two gals who were striding with Team in Training; they correctly assessed it to be a good deal. For about the price of a trail pass, they could race, get a bowl of chili, and a guaranteed raffle prize at the end. They introduced themselves, and I easily remembered one name, as it was also Helen. The mood was light and cheery, with spirit awards going to racer Joe and employee Guy, who never leave their smiles and enthusiasm for life at home. Joe wore bib number 1 – no surprise that he was the first to show faith and register for the race. Guy and all the TDXC employees had been putting in some serious time harvesting snow from the forest to dump on the trails. The grooming was exceptional, and I think (hope!) all the racers were appreciative of the heroic efforts that went into preparing the course. The men started 5 minutes before the women and juniors. I took a caffeinated gel, then we all visited and discussed our age groups while we waited for our start. I didn’t have the normal pre-race nerves, and I guess that I never fully got into race mode. My last race of any sort was the California International Marathon (CIM) in December. Running a road marathon with 7000 (mostly) strangers is decidedly different than a local ski race with a few dozen friends and familiar faces. Other than the obvious differences, there are two distinctions that really matter to me: duration and pacing. Running a marathon is an endurance endeavor, so finishing strong is paramount. I forget that 14k is a short distance to ski, so I forget that I should be pushing hard the whole way. Somewhere in the middle I slowed down to save myself for “later” that never came. The other difficulty that I have with nordic ski racing is that your pace is so dependent on snow conditions, that it is not a useful indicator of performance. While running pace can be affected by factors such as temperature and wind, a runner can generally predict a race pace for a given course and plan accordingly. 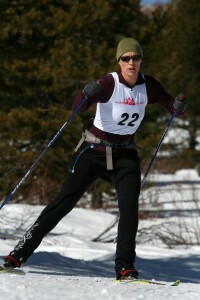 Ski races require you to be in better tune with the effort level required for success. Back to the race… I never got into race attack mode. I comfortably climbed from the start out to the Moon Dance hut. A small crowd of employees was gathered alongside the trail at the top of the road to Euer Valley. There was an exposed rock dead-center in the trail, surrounded by dirt on either side. They were warning us and shoveling snow over the dirt as each skier passed. Love those guys! As we headed down into the valley, a women a couple of decades my senior (yes, DECADES) dusted me, and I never caught her again. I need to put in some serious work if I’m ever going to be good at going down the hills. Later, I would see the other “Team in Training” Helen and her friend going down this very section while I was already climbing out. It would be a long race for them! Down in the valley, I enjoyed the fast course until we got to the only trail that I hadn’t skied earlier in the week – Broken Spoke. I was surprised at the bottom by a frozen lake, and promptly went down. Then there was a section where I had to hesitate to find the trail – the snow was all chopped up in two directions, and I finally picked the path that had the most skate tracks. As we headed back out of the valley, a younger woman passed me. If I would had been in better race mindset, I could have stayed with her or at least caught her near the top. I was still saving energy for that “later” time. I just wasn’t realizing that the race would be over in less than 10 minutes. Before I knew it, we were skating to the finish, and she finished a few seconds ahead of me. I finished in about 45 minutes, with energy to spare… oops. It was still good enough for first in my age group (30 – 39) and a fine raffle prize. See official results here. Race photo by Mark Nadell. Thanks for always being there behind the lens, Mark! I love to hang out after the race to have a chance at scoring a fun raffle prize. The prizes are laid out on a table, and you get to pick one to your liking when your name is called. Normally, the age group finishers are called first, then the remaining racers have a chance to win. In small races like this, everybody goes home with a prize. TDXC Manager JoJo called out the names. The first name in my age group was “Team in Training” Helen (who was still on the trails) – it turns out that a time of 0:00 is faster than all the other times. That’s OK, she called my name with the next group and I picked a bar of red LF glide wax. I hung on to the wax until the prize table was pretty well picked over, then noticed it had been replenished with a nice metal water bottle. I traded my wax for the water bottled and went home a happy camper. At home, I rallied the family to head back over for a ski. We returned to the ski center about 90 minutes later, in time to say hello and goodbye to “Team in Training” Helen and her friend. I hope that JoJo saved a fun raffle prize for them! Nice report, I can’t remember what I did that day, I think I snowshoe ran around crazyhorse to avoid the race, it wasn’t groomed , but ok for shoeing, no skiiers passing. Conditions werent goid enough that I wanted to ski. If I’d known you were doing it, I would have found a spot to watch first and cheer. How was your Spooner weekend? Thanks for leaving a reply! We had a great time at Spooner, despite very thin conditions. We were still able to ski some and snowshoe plenty. I will write about it next week.